The art inspires the music, and the music inspires the art. Krys and Phil will be accompanied by the Iranian percussionist Arian Sadr and Iraqi Saz player Azad Hasan and inspire the kurdish artist Amang Mardokhy to fill two canvasses with his dramatic and vibrant art. Their last Music-Art Happening in Manchester in April 2018 won many accolades and an invitation to repeat the Happening at the Manchester Whitworth Gallery. A short video of this performance can been seen here. The Brampton Happening will have two parts. The first will be western jazz-classical fusion with kurdish percussion. The second will be Kurdish Traditional fused with western jazz. There will be two canvasses produced by Amang which will be avail for auction at the end of the event. FuMar, a sax/piano duo, play cool jazz of their own compositions with an interest in jazz/ classical fusion. Phil is from Cumbria and Krys is from Toulouse. Arian Sadr is from Iran and is an accomplish percussionist already well known to Manchester audiences. www.ariansadr.com and Azad Hassan is an Iraqi saz player. Together Arian and Azad give an authentic Kurdish sound. The music will vary between Kurdish melodies backed by FuMar and FuMar compositions backed by the Kurdish duo. Amang Mardokhy came to the UK in 2002 as a refugee following Sadam Hussain’s attack on villages in Northern Iraq. He went to Art School in Manchester and now has a studio in Hazel Grove. He has an interest in painting to music. The painting will be auctioned at the end of the event. 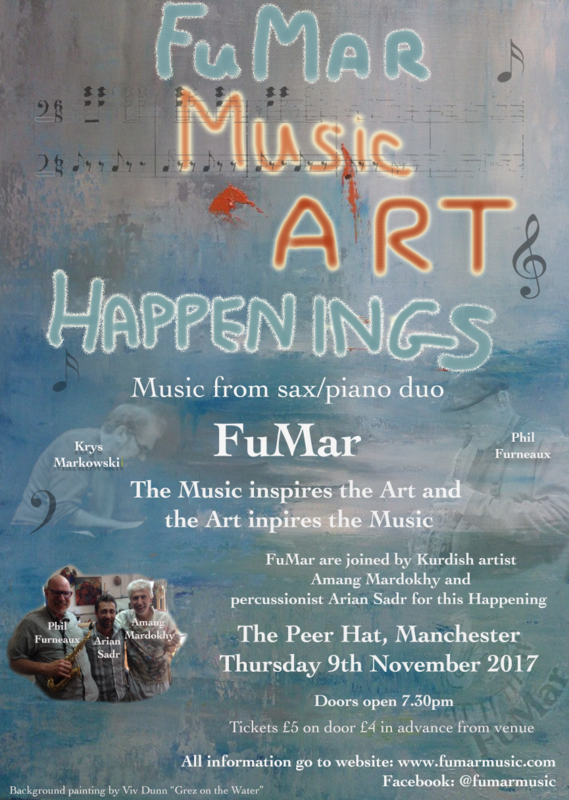 FuMar are organising one to two hour art–music sessions. Any venue considered: Innovative spaces, galleries, co-working spaces, art classrooms. Contact them to find out more. During FuMar's "Tour de France 2016", the duo was invited to give a private performance at the Paris artist Béatrice Thèves-Engelbach's house. It was an exciting concert with a very intimate atmosphere created in her studio. The following day, Béatrice asked FuMar to musically interpret two works of art from her collection. This challenging new request gave rise to two "prototype" compositions which tried to translate shapes, colours and spatial composition into sound and music. FuMar then performed one of these at a concert in Toulouse. There was an interest from a listener to use FuMar's concept and approach to composing in a publication on art–music projects. This success inspired the duo to work intensively with Béatrice on planning art–music events, which led to the concept "Fumarprovisation" and the Lancaster Workshop. FuMar are very grateful for Beatrice's time and patience while working with them on this project. 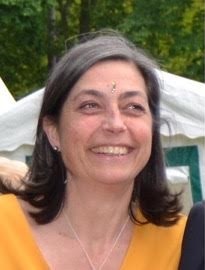 The photo which Béatrice sent to FuMar which started the project (click the photo for the full version). Painting on a zinc Paris roof tile: Landscape by Marie Deloume. Photo © LouisKend999. Getting ready to improvise to Charlotte Gurren's landscape at FuMar's Lancaster Workshop. "Grid" by Isaac Heard. The music FuMar improvised to this artwork can be found below. Art–music workshops take place in art schools and community venues or any innovation space. Part one: Artists bring their work and FuMar improvise a tune from the artwork, of which a recording is made. 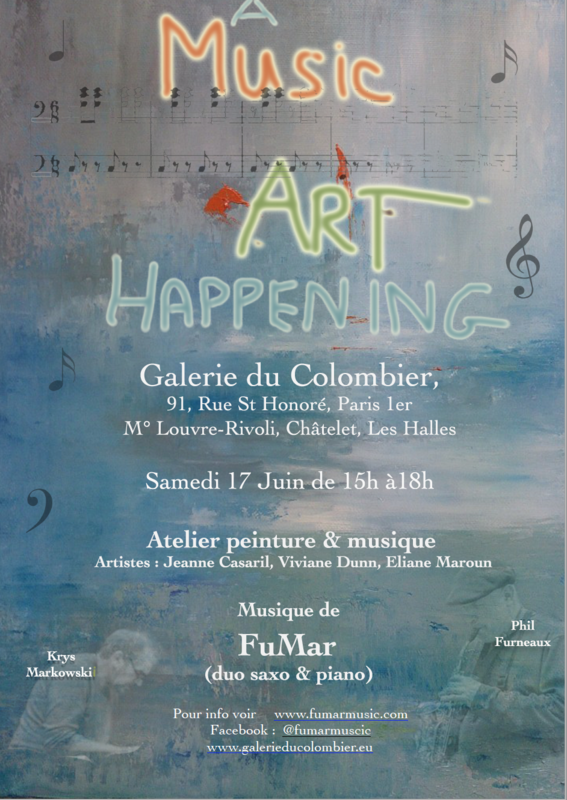 Part two: FuMar play a concert and artists are invited to improvise their own artwork based on the music. Plenery: The work is compared and discussed. Follow on: The artwork is photographed and the chosen work is duplicated in the form of a greeting card with a link to the music. These cards can be sold at gigs and other art outlets. Exciting — no one knows what will happen at any event! These cards will enable artists to become known outside of their local area. The artist will benefit from a small income from the card sales. Meanwhile, FuMar gets to play in lots of different places, enabling their music to become more accessible. 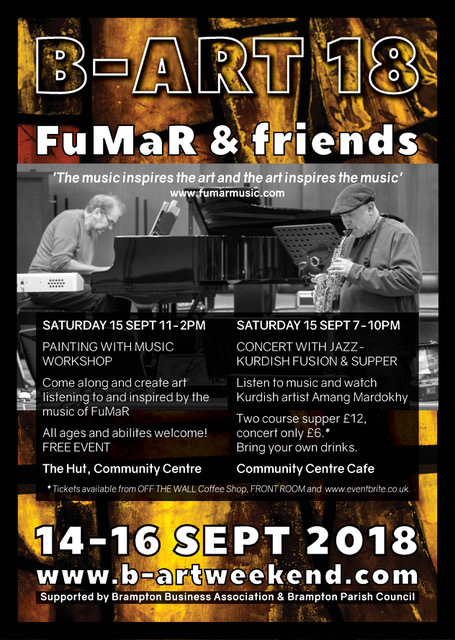 Listen to some of the music FuMar have improvised to artwork.